The new brief. I was given this image. Extract a colour palette of 6 or 8 colours from given image. This is my final palette. Look at spring/summer trends for 2014 on WGSN. Make a life size slip shift paper dress based on one or more of the S/S 2014 trends on WGSN and use your colour palette. Inspiration design from WGSN. This image is called "Botanical Floral" by Illustrator Lyndsay Carr. This is the trend I have chosen as a starting point for my paper dress. 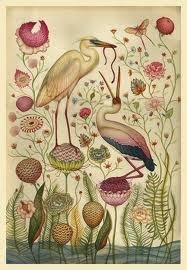 So I have been researching botanical images and Victorian botanical artist. I have attempted to sketche some of the images I have printed out, in my sketch book. Trying to get a feel of the flowers that I am thinking of using in my final design. Some of the botanical images have birds or insects in, which I really liked so I added a humming bird to my attempt at drawing some trailing fuchsia. Lots of designs later and this is the one I am going to go with. You can't see from the image but the two large fuchsia flowers are cut out and stuck back onto the paper with 3D foam pads. All the flowers will be 3 dimensional on the life size dress. I have just over a week to make the paper dress. I truly hope it is not raining or windy, the day I have to transport my paper dress to uni because that will not be good. What a gorgeous design! Lovely to see your working process. Keeping fingers crossed for a dry day.